This week is the end of my third year of exploring London and of writing this blog – a point I must admit I am surprised I have reached. My purpose is the same as when I started, to trace the locations of the photos my father took of London and to give me a push to get out and explore the city. I would really like to thank everyone who reads, subscribes and comments to my posts. I would also like to apologise to all those who comment and e-mail as I am really bad at responding. Writing and researching a weekly post as well as all the normal work and family commitments is a challenge. When I complete one post it is then into panic mode to focus on the next post. I can only admire those who write more frequently. As a thanks for all the comments I have received, I would like to use this opportunity to publish a small sample of comments to my posts from over the last year. I learn so much from these, they provide personal background to the locations I cover, more information about the sites, answers to questions, point out errors (thankfully not too often) and provide links to other resources including a number of fascinating films. So, to start with a post I published in March of last year. 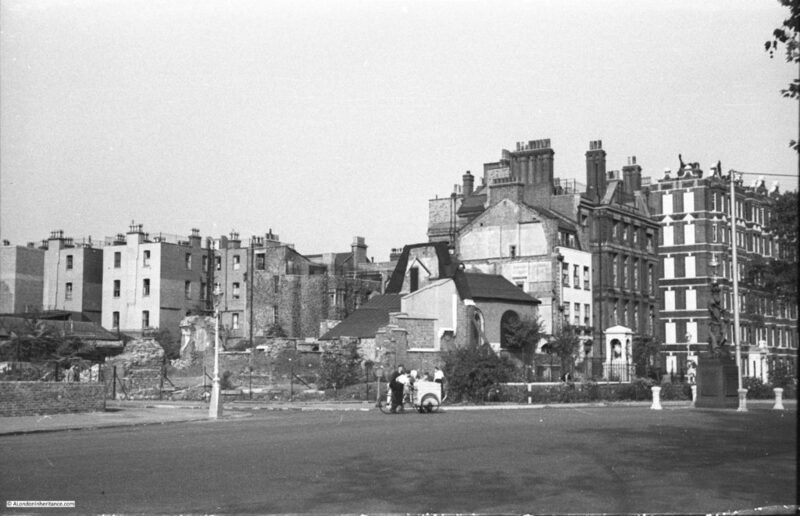 Chelsea Old Church was destroyed during the last war and my father took the following photo of the site. The church was rebuilt after the war to an identical design as the original, and many of the interior monuments were restored and now make the church a fascinating place to visit on the Chelsea Embankment. I started my school life at Cook’s ground in 1939. I entered through the right hand gate on Old Church Street that had an overhead engraved stone sign saying “Girls and Infants”. The left gate’s said “Boys”. I didn’t have far to walk because we lived at Rectory Chambers almost next door. In front of our house was McCauley’s grocery. He had two girls and I went to school with them. Between our house and the school was Roma’s cafe, Rosemary was my mother’s best friend. In front was the “Pig’s Ear”. Wooden beer barrels were off loaded from horse drawn wagons and slid into the pubs cellar through a trap door in the pavement. Coal was also delivered to all the houses by horse cart and unloaded through small iron “manholes” in the pavements. The were no cars parked on the streets. Trams ran down Beaufort St. from Kings Road to Clapham Juction. A fellow on a bicycle lite the gas street lights with a flame at the end of a pole. Then all of a sudden ALL the lights went out. My mother got a summons because a light showed through the tiny bathroom window! Like all the other windows it should have been covered with black cloth. The year after I started school we were labeled and posted by train to Cornwall. I returned home a year later because I had contracted diphtheria. The whole area at the end of the street was now a pile of rubble and a part of the church left standing was boarded up so we could’t get in, though we tried. There were still some of my friends around and we used the bricks to make dugouts and play “war” games throwing rocks at each others trenches. I was once knocked out and awoke in a neighbor’s kitchen while the lady bathed the back of my head. I have a photo of me on the rubble with my baby brother and mother nearby. It was taken by my father before he left for Africa. A neighbor named Bill Mallett became my best friend. He drove a lorry which he had parked in next to the damaged area in front of his house. He told me what had happened while I was away. He helped my mother repair our front windows. She had tomatoes planted in flower boxes on the roof. Paulton’s Square had “victory” gardens planted around the half buried shelters there. All the railings had been removed. I hated to go down after the air raid siren sounded because they smelt so bad. The wardens allowed me to site at the door with them and watch the planes until the noise got too loud. After the “all clear” my friends and I ran through the streets looking for bombs and shrapnel. One of us found a whole incendiary so he became our leader. He took it home for his collection and never did tell his parents! I found a small bomb and we tried to set it off by repeatedly throwing it in our “war zone”. Finally it broke apart and it was filled with a yellow putty. Notices were pasted all around with photos of “booby” traps that were dropped by the Germans. They looked like toys but we never found one! I could have been one of the kids by the ice-cream cart shown above or at least they were my some of my friends. I left Kingsley (Cook’s ground) for the last time through the left gate in 1948, Dr. George Walsh was head master. 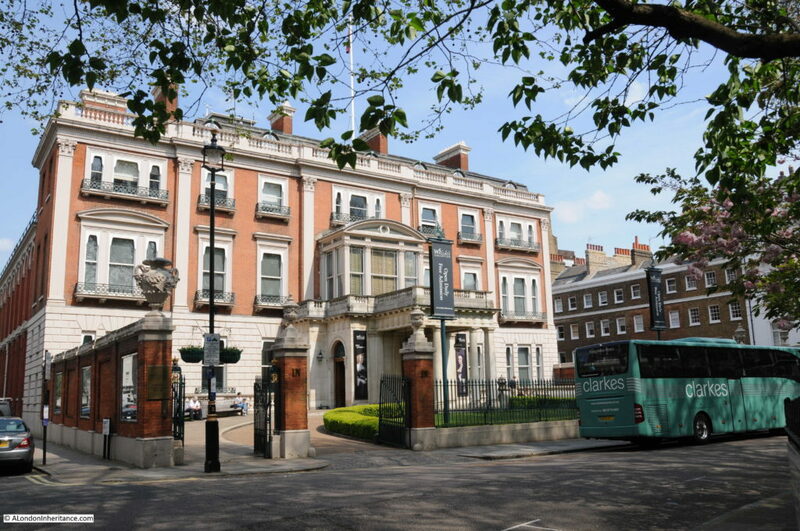 Then in May I wrote about Manchester Square, home to Hertford House and the Wallace Collection. My great-grandfather Stopford Brooke (the founder of the Wordsworth Trust at Grasmere) lived at 1 Manchester Square between 1866 and 1914. His large study was at the top of the very tall house, where he would entertain the likes of Robert Browning, Alfred Lord Tennyson, W.B.Yeats and Henry James. An unmarried sister looked after his seven motherless children, for whom Sunday lunch was the only time when they could be sure to see their father. who sat at the end of the long dining-room table. His long sermons stirred the conscience of late Victorian London. 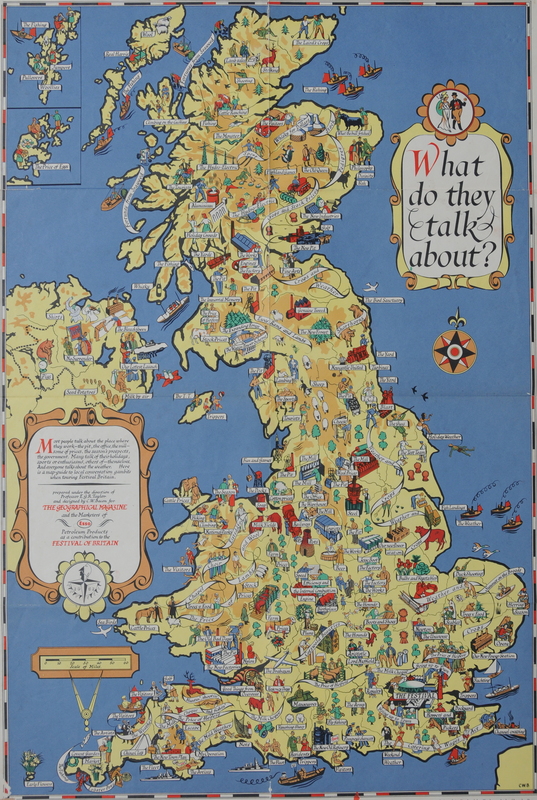 It Can Now Be Revealed is the title to one of the many booklets published at the end of the war to record the experiences of specific organisations or London boroughs during the war and also looking forward to post war reconstruction. It Now Can be Revealed covered British Railways and as well as covering the war, also provided a very positive view of the future development of the railways, and included this drawing of a new Finsbury Park station which will be rebuilt “on the most modern lines”. News Theatres were small cinemas for showing film newsreels etc….they built one in the Queens Building public foyer at Heathrow (opened 1956) and I think there was one at Victoria Station. Up until the 1970s or so it was common to be able to walk in and out of a cinema at any point in the performance, so I guess the idea of a news theatre (in pre-TV days) at a station would be to pop in and pass the time while you waited for your train. In June I went to Smith Square. I spent many many hours walking around it during the 1970’s being a Police Officer at Rochester Row. Harold Wilson, Prime Minister twice, used to live at number 5 Lord North Street and he and the house had 24 hour armed protection, just one of many armed protection posts on Rochester Row and Cannon Row’s ground. 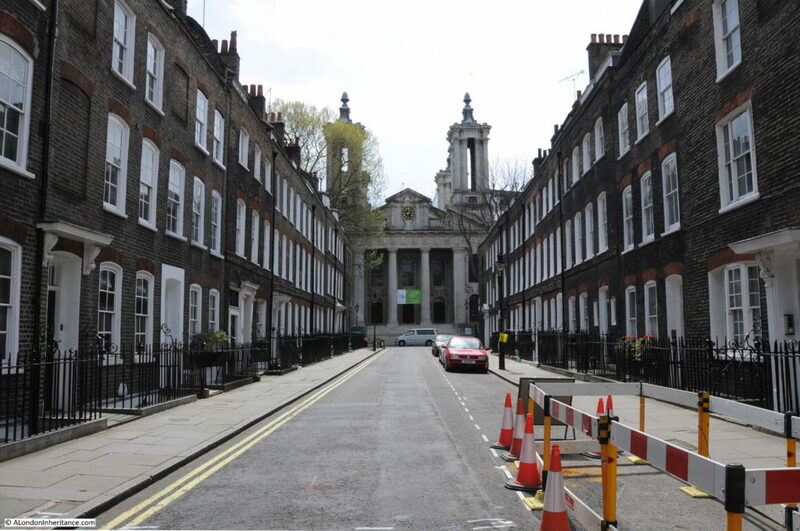 Next time you visit see if you can find the two ‘ducks’ in Smith Square. Then in July I wrote a number of posts on the Festival of Britain, one of which included this fantastic map published to illustrate the “local conversational gambits when touring the country”. I went to the Festival of Britain and it was a memorable experience for someone especially who had lived through the war years , as well as going to the Festival itself we saw much of London still showing all the dreadful damage still awaiting re-development. As well as that we got to go into the Dome of Discovery and saw the actual “largest piece of Plate Glass ever made at that time” My father worked on that and Pilkington Brother Glass manufacturers of St Helens, Lancashire had to have a special “low-loader vehicle” made to bring it down to London. We all lined the streets to see it go on its way. My father was a joiner from Tyneside who traveled to London and found work on the Royal Festival Hall construction site. He helped to make some of the concrete shuttering. He returned to Tyneside after the Festival of Britain, but it was an important period in his life. He told me that the construction workers were given free tickets to the inaugural concert, which he enjoyed. I am researching my father’s life and would love to know more about what it was like to be involved in building the Hall. If anyone knows of any workers’ accounts, I’d appreciate hearing about them. Unfortunately I have not found any accounts from those who worked on building the Royal Festival Hall and the Festival in general – they would be fascinating to read. As well as London, my father also took lots of photos across the country whilst during National Service and on cycling holidays across the Youth Hostels of the country. In August I visited a number of these locations across England and Scotland. 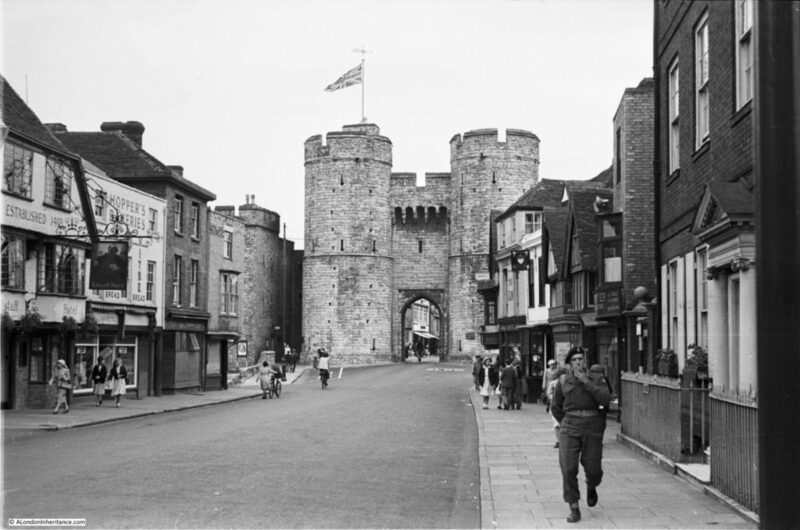 One was Canterbury in Kent and this is one of the photos my father took. 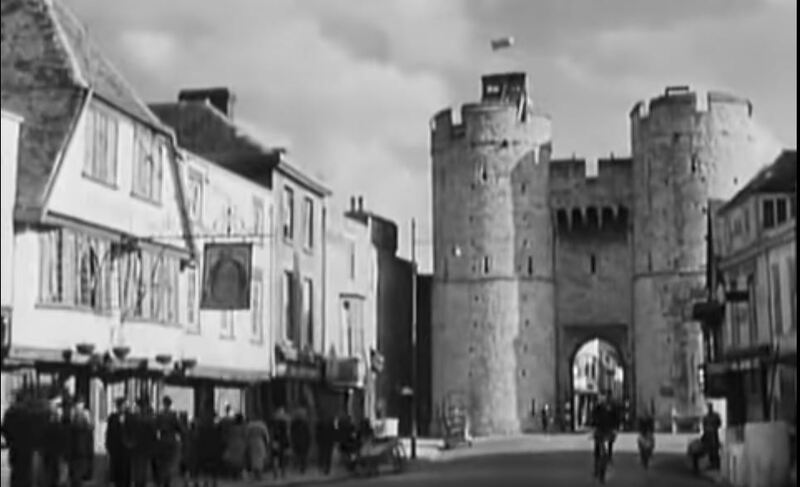 Both Annie and Geraldine directed me to the 1944 film A Canterbury Tale which can be viewed online here. A really good film, but obviously of the period and the end of the film includes a number of shots in and around Canterbury showing how badly the city was bombed. One scene includes the following clip taken from almost exactly the same position as the photo my father took. I also had some interesting comments on the blog and via Twitter correctly advising that actually the Sun, or perhaps even the Andromeda Nebula would be the furthest things that could be seen, so perhaps I need to correct the title to terrestrial objects, and with the level of light pollution in London I suspect you could never see the later. in October I went to the area around St. Pancras Old Church to find the location from where this and a couple of other photos were taken. The church is in the background on the right behind the trees. Howdy! The Purchese Street depot was built in 1898 by the Midland Railway. The depot took the form of drops – the coal fell from a wagon on the high level directly into dealers’ wagons avoiding the time and expense of transhipment but generating noise and dust. Last time I was up that way there was a rather nice red brick retaining wall. There was a flying bomb dropped around here and maybe that is why the place looks rather messy. 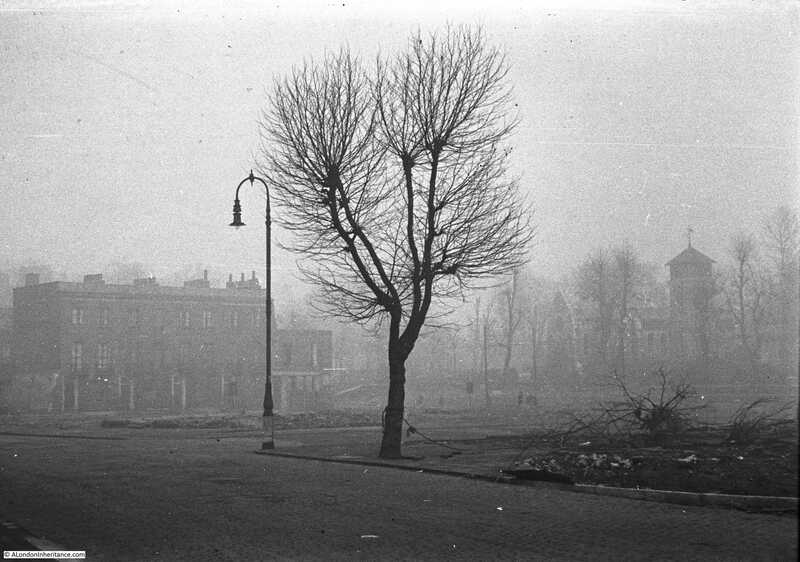 1940-41 damage was usually tidied up more neatly than that. Coal was held in a hopper, and the coal merchant would park the lorry underneath and hold an empty sack under the hopper outlet, press a pedal to open the hopper, allowing coal to fall into the sack, which was then stacked on the back of the lorry where they stood. Made loading a bit easier. My dad used this yard a lot. One day a fellow coalman had a seizure/fit whilst filling a sack and was just rooted to the spot with his foot on the pedal as coal fell all over him. The other coalmen fortunately were on hand to save him. I was just a kid and was there with my dad that day, I’ll never forget it. Pickle Herring Street ( where incidentally there were a number of fish stalls) is the image that you’ve associated with the large ship actually shown in the neighbouring photograph, swap the captions and you’ve done it. My own father who was born in 1924 actually grew up around the Shad Thames an Pickle Herring Street area, playing amongst the barges along the Thames, an activity made famous by the 1950 Film The Mudlarks. His mother apparently worked on the family fish stall on Pickle Herring Street, as mentioned above and not surprisingly contracted severe arthritis in her hands, working in such freezing conditions in the winter here, must have been dreadful. 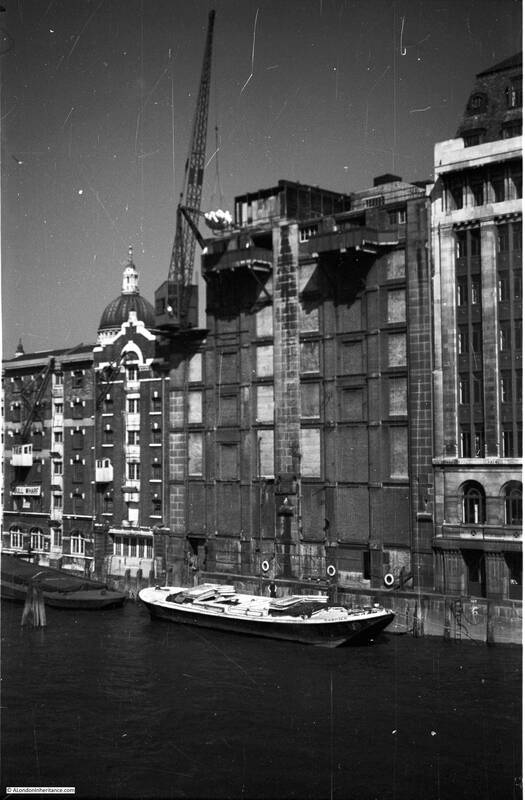 I recall walking around Shad Thames in the 1980’s before major redevelopment and restoration and finding abandoned Wharehouses still with the produce they handled pouring out of rotten doorways, this included flour that probably would have been used by the nearby Peek Freans and Jacobs biscuits factories. I was also sent some wonderful photos from David Smith. 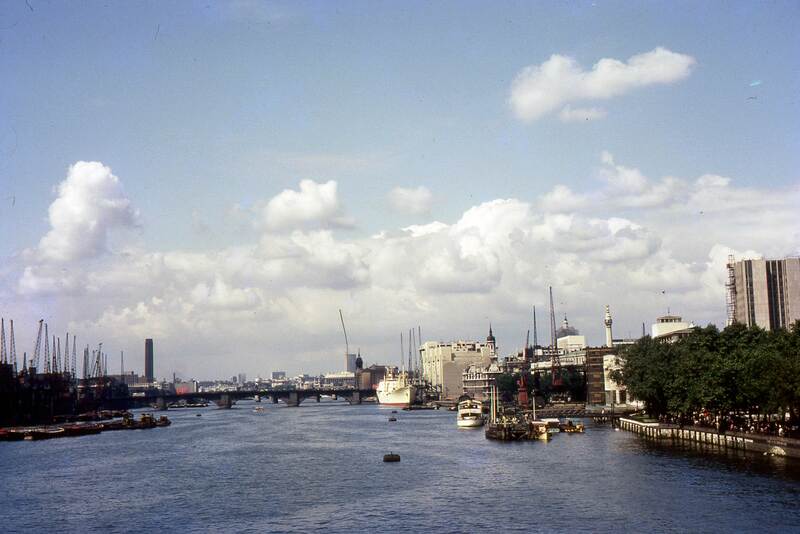 His mother had taken them in the 1960s including this photo looking up the Thames from Tower Bridge. I remember, it rained that day too, as it so often does for the parade! 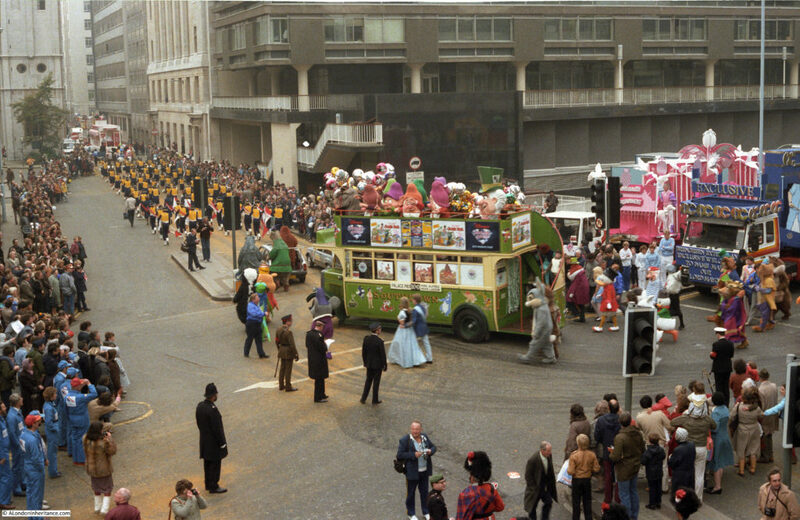 But nobody minded… Long live the parade! The walkways above street level, which can be seen in the views of London Wall, are all part of the ‘Pedway’ scheme for The City of London in the 1950’s and 60’s. It was planned to separate pedestrians from the road traffic and provide a continuous walkway from building to building and across roads, all new buildings were required to provide this and as adjacent sites were developed the pedway would gradually expand to cover the whole of the city. Many buildings had included this and quite a few bridges were built but inevitably there were many dead ends awaiting further development and the whole plan was abandoned by the 1980’s. The film is a brilliant account of the rebuilding of this part of London and the Pedway scheme as the walkways were called. I highly recommend watching the film. Also in November I wrote about the Tiger Tavern pub that was once on Tower Hill. 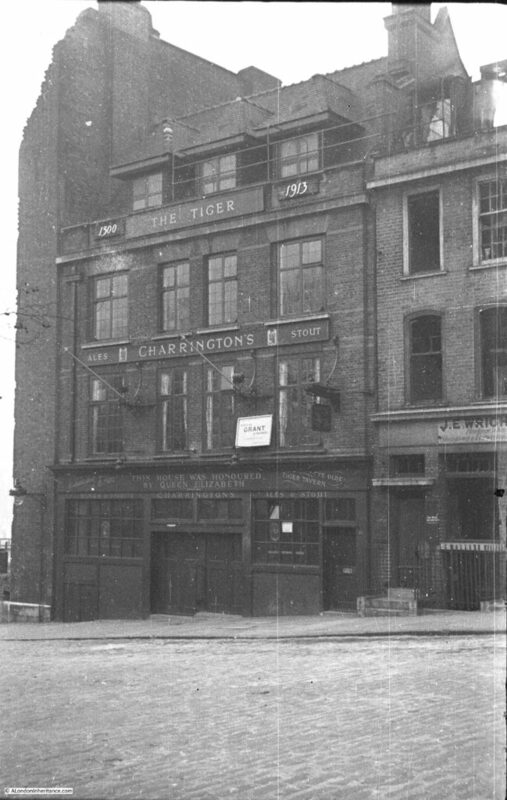 You mention a blocked off tunnel in the basement of The Tiger, I have been in that tunnel and also seen the mummified cat, I spent many hours there as my uncle was once the manager. It would be really interesting to know if any of the tunnel remains under Tower Hill. 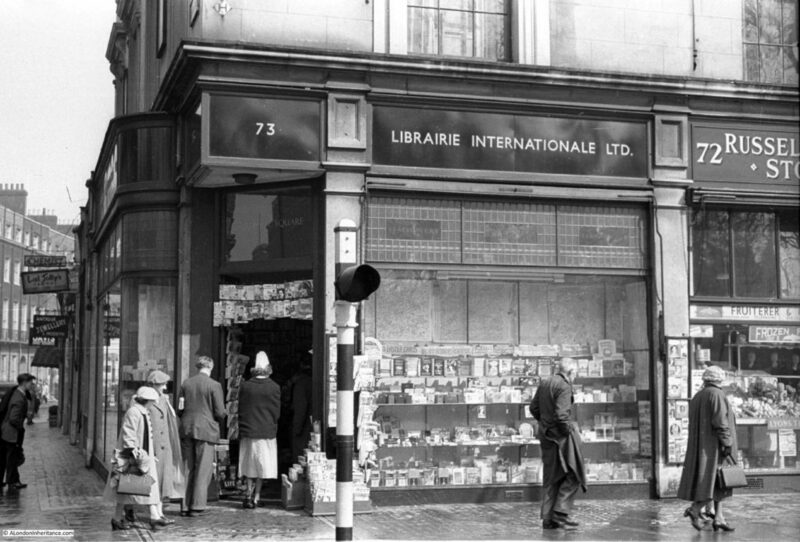 In January I wrote about the Libraire Internationale in Russell Square. The Times of 1/2/1935 reported on a case in which Gladys Marie, the Duchess of Marlborough, claimed damages from a number of defendants for circulating a libel. “Mr Theobald Matthew, for Librairie Internationale [of Russell Square, W.C.], said that his clients expressed their regret as soon as the libel was brought to their attention and they now offered a sincere and unqualified apology to the Duchess.” Polite radicals indeed! And that was just a small sample of the fascinating and informative comments I received over the last year. Again my thanks for every single comment, all the feedback and additional information. And now to start next week’s post. This entry was posted in London Journeys and tagged Chelsea Old Church, Exploring London, Tower Hill on February 19, 2017 by admin. Thank you so much for all of your wonderful writing and photos! Thanks Lisa. Really appreciate the feedback. Happy third anniversary, David ~ & wishing you many more to celebrate! It’s a weekly pleasure to come to this website, knowing that the post will have real substance, & be carefully documented & beautifully illustrated. How you do pull this off on such a regular basis impresses me mightily. It’s like you have a full-time part-time job, if you know what I mean! And we readers are the beneficiaries. Thank you. One small request for 2017: Could we have more Identify This Location puzzles, please? it’s just great when so many people jump in. Thanks Geraldine – it is difficult which is why I am so embarrassed by my lack of response to comments and e-mails etc. Good point about the mystery locations. I have a number of photos that still need identification so I will put together one of these for the future. absolutely enjoyable reading. Real stories. I don’t always comment but I always read your posts – always interesting and some fascinating details. They are much appreciated and long may you have the energy and desire to continue! Perhaps you could split some posts into parts – they can be long and frequently I leave half way through and return the next day. It might solve the problem of the regular committment that you mention. Peter, that is a really good point. I am never sure what is the correct length for a post and what works for the reader. I try to limit posts to a maximum of 3,000 words, but some have been longer. The usual average is 2,000 words, plus the photos, occasional maps and prints etc. I will see how I can improve on this. Feel free to substitute this version if you have the time. Bill, thanks for this. Colour looks much better. I will update the photo on the blog. Thanks again. Just discovered this site. Fascinating–particularly the comments from those who share their memories to go with the amazing photographs.